Recently we’ve talked about Zebra’s new ZC Series ID and loyalty card printers, which make card printing much easier and more cost-effective while enabling many breakthrough security features. But if you’re just getting started with ID or loyalty card printing or you’re looking to get the most out of an upgrade to Zebra’s newest printers, you also need the right software to create a complete card solution. Ideally, you want card printing software that’s comprehensive, flexible, and easy to use. A solution should interface seamlessly with your printing hardware, support all the latest Zebra printer capabilities, and help you produce exactly the type of cards you need with your preferred security features. Fortunately, there’s a fully compatible and ready-to-deploy solution with our recommended IDpack software. IDpack comes in three versions that offer the most complete and flexible solution for ID card, badge, and label production on the market. IDpack is compatible with all Zebra card printers, including the latest Zebra ZC100, ZC300 and ZC350 series models, and it helps you print beautiful and secure cards for identification, access control, memberships, events, and more. IDpack supports all plastic ID cards from Zebra and other manufacturers, and it also supports paper badges with more than 1,000 templates. 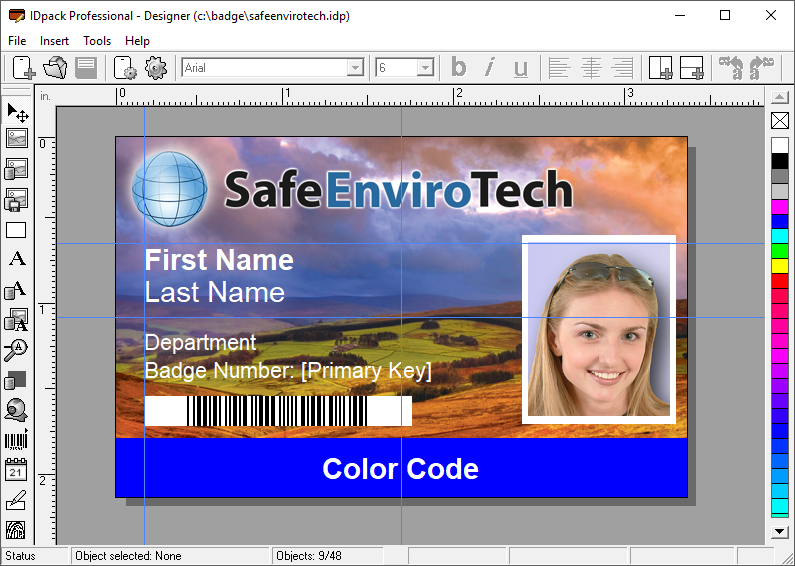 For basic single-sided ID cards with fewer security options, IDpack Element is a great option at just $99. It helps you print plastic PVC cards and badges as well as paper badges, with integrated design and picture editing tools. To help you get started, IDpack includes 20 free card templates and an easy-to-use interface, plus barcoding. If you need two-sided cards or more enhanced security and user access controls, but you don’t need advanced biometrics, IDpack Business is an excellent choice at $299. Similar to IDpack Element, it comes with 20 free card templates and all the photo and design editing tools you need to customize your cards. But it also includes support for applying advanced security with user privileges management. This version includes greater database flexibility as well, with support for MqSQL and SQL Server as well as Microsoft Access. You also have a choice of using barcodes or QR codes on your cards. For medium- to large-sized organizations with high security requirements, we strongly recommend IDpack Professional. This version allows you to produce and capture fingerprints, signatures, ID photos, and barcodes, and you can also encode magnetic stripes and smart chips to create highly secure cards. This means it’s also the best choice for using with Zebra’s ZC300 Series card printers, which enable additional card security layers, watermarks, and color-changing features for added branding and protection against copying and counterfeiting. The software also includes all the core features of IDpack Element and IDpack Business, and you can integrate it with your enterprise systems using command lines or an SDK feature. With its support for high-security smart cards and magstrip cards, IDpack Professional is priced at $599. Zebra Technologies recommend combining IDpack with Zebra card printers, including the newest ZC Series models.